It takes a village to maintain a thriving economy and growing population. City planners knew this when they developed Phoenix, Arizona, now the 5th largest city in the U.S. Since its founding, Phoenix was carefully divided into community type residential, shopping, and business hubs. The “village plan” still lives today as new Phoenix areas are developed for real estate. Your Phoenix real estate options are as diverse as its population. Urban types in the market for Phoenix lofts for sale are flocking to the Central Corridor, those who prefer a quaint community feel are drawn to the many Phoenix master planned communities including the Biltmore Estates, and golf lovers have a difficult decision ahead of them with so many Phoenix homes for sale right along side the greens. Phoenix has a lower cost of living compared to other metropolitan cities and Phoenix real estate is still affordable. Search my Phoenix real estate MLS database or sign up for My Home Finder. With My Home Finder, Phoenix real estate listings that meet your criteria will be emailed to you within hours of going on the market. Either way, I’ll find the Phoenix home just right for you and your budget. With so much to see and do, it’s a good thing Phoenix has on average 325 sunny days a year for you to get out and enjoy all it has to offer. You could take in a new cultural, nature, or adventure experience every day of the year and still not see it all! There’s been a renaissance of construction or renovation of downtown landmarks like the Phoenix Civic Plaza, Phoenix Central Library, Phoenix Art Museum, the Orpheum Theatre, Collier Center, and Bank One Ballpark to name just a few. Hike, climb, bike, or enjoy some water sports in Phoenix at more than 1,700 acres of parks located throughout the city. Some of the most popular include Squaw Peak, Camelback Mountain, and South Mountain Park, the largest municipal park in the world with 16,500 acres. Some of the world’s most renowned golf courses are located in your backyard when you buy a home in one of Arizona’s golf communities! 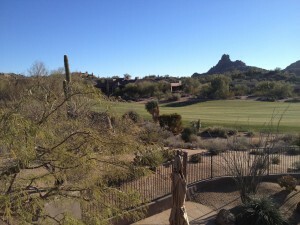 Phoenix golfers have their choice of teeing off on over 200 golf courses each with its own set of attractions, challenges, indigenous wonders, and mountain views. Phoenix real estate is a golfer’s paradise with courses ranging from award winning, target-style designs to traditional tree-lined courses and desert courses with rocky terrain to really test your skills. The National Golf Federation named Phoenix the “Golf Capital of the World”. Phoenix is also a perennial favorite of The Phoenix Open (PGA), the Standard Register Turquoise Classic (LPGA), and The Tradition (Senior PGA) pro golf tournaments. Set up a Custom Search Page by creating a FREE Home Finder Account. You'll receive notifications by email whenever a property that meets your criteria or has a price change comes on the market. It's a great way to stay on top of the homes you are considering before someone else does! Contact CLA Realty today to make your realty needs a reality!